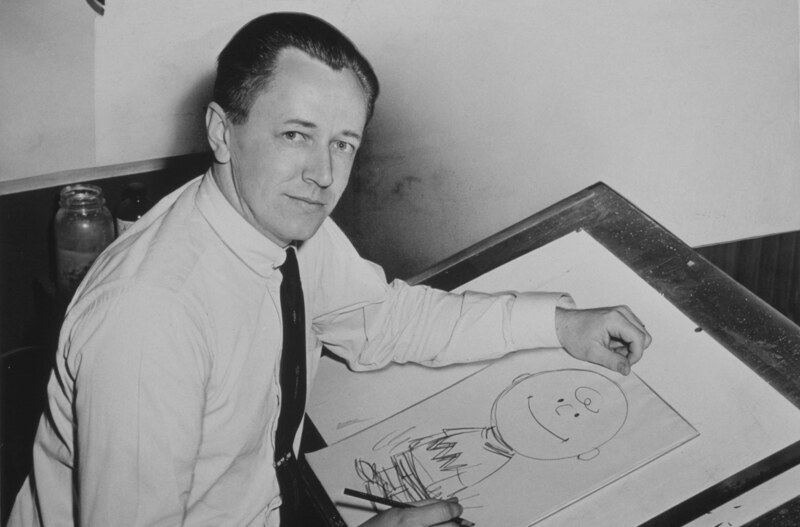 The story of Peanuts is the story of its creator, Charles Schulz- the man who changed everything about comic strips. Somewhat fittingly, this nickname was in reference to a horse, Spark Plug, from the Barney Google strip. When I was growing up, the three main forms of entertainment were the Saturday afternoon serials at the movie houses, the late afternoon radio programs and the comic strips. My dad was always a great comic strip reader, and he and I made sure that all four newspapers published in Minneapolis – St. Paul were brought home. I grew up with only one real career desire in life, and that was to someday draw my own comic strip. Schulz was also quite smart and skipped two grades in elementary school, with the result being even more isolation and inability to make friends among his older classmates. A few years after finishing high school, now at the age of 20, Schulz nearly simultaneously experienced two abrupt life changes. The first occurred in February of 1943 when his mother died from cancer, with her last words to him reportedly, “Goodbye Sparky, we’ll probably never see each other again.” You see, Schulz had recently been drafted and set off for basic training days before her death. I eventually would letter the entire comic magazine in English, French and Spanish — and at one time I think I even lettered it in Latin, I’m not sure. And for this [Roman Baltes] gave me $1.50 an hour — I was just to submit my time — and I was always very efficient. He would call me up during the day when I was working at Art Instruction. ‘Sparky, I’ve got some things here and I sure would like to have them by tomorrow morning.’ So I would drive from Minneapolis all the way to downtown St. Paul — sometimes taking the streetcar if I didn’t have my dad’s car — pick up what he wanted, which he left outside the door, and then go over to Art Instruction for the day. I enjoyed it thoroughly, and I could letter very fast. One day I had done a special fast job for him, and as a reward he let me draw a four-page story which had something to do with some soldiers or something, and then he actually let me do two pages of humor cartoons, and some of them were little kids. After they printed two of them, for which I think I got $20 a page, he then said that the priest who was running the outfit didn’t care for those, so that was the end of that. Nevertheless, his work at Timeless Topix got him enough local attention and experience that, in June of 1947, he managed to get hired by the Minneapolis Tribune to draw a strip he called Li’l Folks. Still living in his father’s basement and getting paid ten dollars per comic (about $111 today), Schulz was in heaven. One can absolutely trace the origin of Peanuts to Li’l Folks- from the well-dressed boy who loves Beethoven to a dog with human traits to a bald-headed kid named Charlie Brown- named after a colleague of Schulz’ at Art Instruction. The tone was also similar- a mixture of loneliness, sadness, sarcasm, and outward expressions of childlike joy. As for the character that would eventually take the lead, Charlie Brown, this seems to have been most closely inspired by the man himself, though it’s generally thought that all the characters embodied elements of Schulz’ personality. For instance, Schulz once revealed in an interview that Linus, among other things, represented his spiritual side. Continuing the parallels, his father, Carl Schulz, was also a barber the same as Charlie Brown’s dear old dad. On top of this, the red-headed girl Charlie Brown always longs for but never attains also mimics Schulz’s real life one time flame- a red-haired woman by the name of Donna Mae Johnson, who Schulz proposed to, but who turned him down and not long after married someone else instead. Going back to Li’l Folks, Schulz attempted to get it syndicated into newspapers across the country, which was generally necessary for a comic artist of the day to make a career of the job. But for three years, there were no takers. Things finally changed when United Features Syndicate expressed interest in the then 27-year-old Sparky Schulz’ rather unique comic. But there was a problem- there were already comics out there with similar titles, like Little Folks and Lil’ Abner, so a new name was needed. As for what the name should be, that choice was taken out of Schulz’ hands when it was decided at United that the comic should be called The Peanuts– borrowing from the name the TV show Howdy-Doody had for its on-stage audience of kids- the Peanut Gallery. In an attempt to phase out the name, at one point he tried to give the strip a subtitle- “Good Ol’ Charlie Brown”- but that name didn’t catch on. It was forever Peanuts. At a time when comic strips were dominated by action-adventure, slapstick, marriage humor, and melodrama, Peanuts was different. The comic expressed sadness, anger, depression, isolation, insecurity, and inferiority. Depression was rarely talked about out in the open in the 1950s, much less in a comic strip. Lucy’s advice – which she always gave and always made Brown feel worse – was a paraphrase of the typical given at the time- as in it’s on you to choose not to be depressed. However, it’s clear that Schulz knew better. Back when the comics were printed large enough that they could accommodate detailed, elaborate drawings, Peanuts was launched with a tiny format, designed so the panels could be stacked vertically if an editor wanted to run it in a single column. Schulz somehow turned this oppressive space restriction to his advantage, and developed a brilliant graphic shorthand and stylistic economy, innovations unrecognizable now that all comics are tiny and Schulz’s solutions have been universally imitated. Every now and then I hear that Peanuts isn’t as funny as it was or it’s gotten old. I think that what’s really happened is that it changed the entire face of comic strips and everybody has now caught up to him. I don’t think he’s five years ahead of everybody else like he used to be, so that’s taken some of the edge off it. I think it’s still a wonderful strip in terms of solid construction, character development, and the fantasy element. Things that we now take for granted—reading the thoughts of an animal, for example—there’s not a cartoonist who’s done anything since 1960 that doesn’t owe Schulz a tremendous debt. That said, things started off slow for the strip and at the end of its first year in circulation a reader survey of comics conducted by New York World Telegram put it dead last in popularity. Schulz kept churning the comic strips out, however, and within a decade Peanuts was in hundreds of newspapers across the country and Schulz was beginning to be recognized as one of the best comic creators in the world. Never giving in on its ideals or dealing with hard-to-talk about subjects, Peanuts soon found its way on the cover of Time Magazine. It also adapted to the times, bringing in characters that continued to push the envelope in a changing world. For example, in 1966, Schulz introduced Peppermint Patty- a tomboy who wears shorts, open-toed shoes, calls everyone by a nickname, and lives with only her dad. Peppermint Patty was quickly the strip’s most complex, fully-realized character, who dealt with the political issues of the day without hitting the reader over the head. Yet, she still possessed a similar inferiority complex as almost every other character in the strip- always believing she looked funny and wasn’t quite good enough. Moving on to 1968, a few months after the assassination of Martin Luther King, Schulz introduced Franklin, Peanuts‘ first black character, who attended the same classes as the white students, became friends with them, and whose father fought in the Vietnam War. In the end, Peanuts went on to branch out into TV specials, movies, and best-selling books. According to Forbes, for a time Schulz was one of the highest-paid entertainers in America, during his heyday estimated to have been earning in the realm of $30-$40 million per year, while Peanuts appeared in over two thousands newspapers and was translated into over twenty languages in over 75 countries. On top of that, gross revenues from all sources of revenue related to Peanuts combined saw it bringing in in excess of a whopping $1 billion annually at its peak. All told, nearly 18,000 editions of Peanuts were published- and, unlike so many other famed comic artists who ultimately resorted to hiring assistants to help out, Schulz drew every single edition of the strip. Nevertheless, he still refused to let anyone but himself draw the comic. And so it was that in December of 1999 he announced his retirement. Mere months later, on February 12, 2000, Schulz died – a day before his last Sunday strip appeared. To me it was not a matter of how I became a cartoonist but a matter of when. I am quite sure if I had not sold Peanuts at the time I did, then I would have sold something eventually; even if I had not, I would continue to draw because I had to. The aforementioned art instructor Schulz named Charlie Brown after, Charlie Francis Brown, once stated in an interview that he got in a little temporary hot water with a police officer when the officer demanded his name. This prompted Mr. Brown to reply, quite honestly, “Charlie Brown.” The annoyed officer apparently didn’t believe him. One of the most famous Christmas specials of all time- A Charlie Brown Christmas, had its genesis in a conversation TV producer Lee Mendelson had with representatives from Coca-Cola. They asked if Schulz had ever considered making a Peanuts Christmas special, to which Mendelson stated in the affirmative and a deal was quickly made for the special. Mendelson then called Schulz, telling him, to quote Mendelson, “I had just sold a Charlie Brown Christmas show. He asked which show and I told him, ‘The one we’re going to make an outline for tomorrow.’ And we literally did the outline in one day.” Unfortunately for the pair, when the program was screened by CBS executives, they were less than thrilled. They didn’t like the jazz soundtrack; they didn’t like the fact that real children did the voices of the characters; they didn’t like that the program lacked a laugh track; they didn’t like A Charlie Brown Christmas – end of story. Their official verdict was, “this is probably going to be the last Peanuts special. But we’ve got it scheduled for next week, so we’ve got to air it.” When A Charlie Brown Christmas made its debut on December 9, 1965, it was seen in over 15 million homes, topped only by the wildly popular Bonanza. It amassed glowing reviews, critical acclaim, as well as an Emmy and a Peabody award. Well spotted CBS. When Schulz’ first wife, Joyce Halverson, discovered the then 47 year old Schulz had been having a several month long affair with a 25 year old Tracey Claudius who he first met at a photo shoot, she demanded he end the affair. Not long after, Schulz published an edition of Peanuts in which Snoopy laments, “What do you do when the girl-beagle you love more than anything is taken from you, and you know you’ll never see her again as long as you live?” Snoopy then is shown at his food dish, stating “Back to eating!” Ultimately Schulz and his wife divorced. As for his perspective, he would later state in an interview, “I didn’t think she liked me anymore and I just got up and left one day.” Within a year of that, he married another woman, Jean Forsyth Clyde, who he met at his hockey rink. The couple stayed married for 27 years until his death in 2000. The character of Franklin would help inspire a young Robb Armstrong to go on to become a cartoonist himself, eventually creating the famed Jump Start comic strip. Many years later, Schulz would ask permission to give the character of Franklin the last name “Armstrong” in homage to Robb. Schultz one said that to be a good comic strip writer you had to be “fairly good” at a number of things. You had to be a fairy good artist; if you were very good, you’d be painting pictures. You had to be a fairy good writer; if you were very good, you’d be writing novels. And you had to be a fairly good humourist; if you were very good, you be a professional joke writer.